We had a week-long holiday in Taupo a couple of weeks ago – a Christmas present from (Great) Aunty Beryl. We stayed at Taupo Ika Nui, which was quite nice (certainly very conveniently located, right across the road from the lake, and a very short walk to the shops). The start had a bit of a hiccup – we planned the date for the holiday months ago, but it ended up clashing anyway – Olyvia did a duathlon on Mother’s Day in Mangere, which was two days into hour week-long stay. We ended up deciding that Samuel and I would go to Taupo on Friday as scheduled, and then come back Saturday night, watch Olyvia finish the race, have a mother’s day lunch, and then all go back to Taupo Sunday afternoon. This worked out reasonably well, except that Samuel and I couldn’t find our way through Mangere (most of the roads we needed to go down were closed; some sort of “spectators this way” signs would have been nice) so missed Olyvia finishing. Then the post-event stuff took forever, and so lunch was very, very late, and so we got back to Taupo later than we would have liked. The rest of the week was great – we didn’t really do that much: a visit to Craters of the Moon and Huka Falls were about all the tourist-y things we did. We did a little shopping, quite a bit of walking, and Samuel spent a great amount of time at the playground. There was a heated pool (and two spas) where we stayed, so we also spent a reasonable amount of time in the water, despite the time of year. Unfortunately, for some reason Samuel woke up around 5:30am each morning we were there (he normally sleeps until about 7:15am), and didn’t sleep for that long during the day (and didn’t eat that well either), so we came home rather exhausted rather than refreshed. Thankfully, once we got home his habits reverted to normal, so we’ve recovered (and I’m nearly caught up with work) somewhat now. Photos from the trip are on Flickr (some were taken with my phone, and some with Olyvia’s phone, so they aren’t as good as ones taken with the camera). There’s also a short (~4 minute) Animoto video (18MB mp4) of the photos (view directly from Animoto). 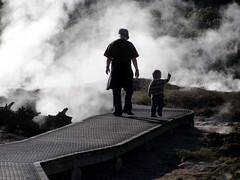 Posted in Uncategorized.Tagged animoto, craters of the moon, holiday, huka falls, photos, taupo, video.